Many of our clients are new to graphic recording and are looking for information about how it works and how to bring it to their events. While you're researching, we want to reintroduce this super cool practice and its value as we see it. Sometimes called visual note-taking or scribing, is drawing verbal ideas into visual maps during live events. Graphic recording artists are usually hired to be present during speaking events, workshops, meetings, conferences, focus groups and other similar engagements, to create a visual capture of what the speakers discuss during the session. Our artists work with markers on a large drawing surface, or digitally on screens so that the audience can see the drawing unfold live while the event happens. Depending on the event flow, we can create multiple panels or a single continuous drawing. Our agile artist team often scales to create larger and more involved projects. Our team has diverse artistic backgrounds, so we embrace a range of styles! After the event, we pack up our drawing boards for our clients, who often take them back to the office to display them internally and/or for customers. We also follow up with digital versions of the drawings that can be shared confidentially or published broadly. A graphic recording artist acts as an impartial party, so we don’t need to have deep understanding of the subject matter of your event before arrival. We are trained to listen closely and use context to establish meaning and make connections, which we translate to the drawings. So, planning and preparation before the event can be refreshingly simple. The planning process, the live drawing, and the shape of the output depend on the event. After years of working with organizations of all sizes, at events of all types, we can make recommendations and tailor our work to your event’s special needs. If you're interested to learn more about graphic recording for your event, please reach out! Audience Engagement. Humans are both verbal and visual learners, and they need both to take in and cement new information. 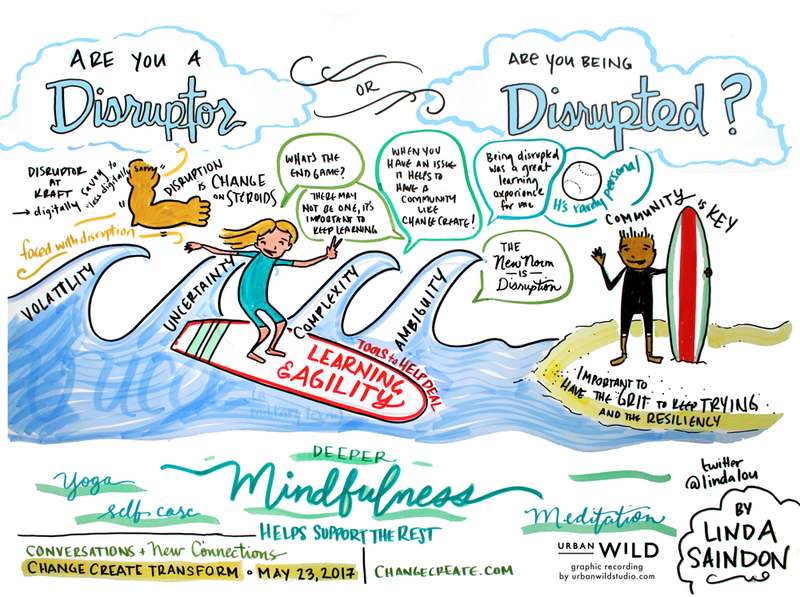 As an event is happening, the graphic recorder captures the big ideas, reinforcing them visually so that as audience members watch, they are constantly drawn back in to the content at-hand. Entertainment. Graphic recording is usually improvised on the spot, and can take almost any shape. This dynamic style of information capture is inherently interesting and even captivating to onlookers, who might otherwise get distracted. Lasting Record. Most events take weeks and months of content and logistical planning, only to fly by in a matter of hours. Graphic recording creates a living reference of all that work and valuable output. Upload-Ready Shareable Content. Graphic recordings can be uploaded to social media, shared in event follow-up newsletters, and/or included in reports and executive summaries. Because of its usefulness and versatility, visual note taking can be hired for lots of different kinds of live events. The possibilities are many, and clients often come to us with new ideas. Beyond graphic recording, we also illustrate stories and infographics, create live art and more. If you have questions, we can start by talking through your ideas and goals to make recommendations. Like what you see? Contact us to tell us about your event and get a conversation started.